Today is November 18th, and that means it’s Furston’s birthday! Furston is an Old English Sheepdog breed of dog. Old English Sheepdogs are known for their fluffy grey and white fur. 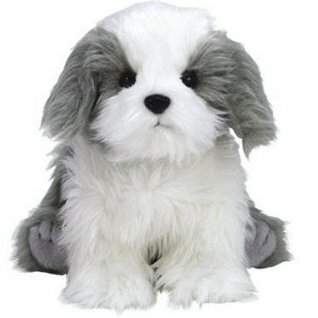 Did you know, the Old English Sheepdog has featured in many different movies? Famous Old English Sheepdogs include Ambrosius (Labyrinth), Max (The Little Mermaid), Nana (Hook), Edison (Chitty Chitty Bang Bang) and The Colonel (One Hundred and One Dalmatians). 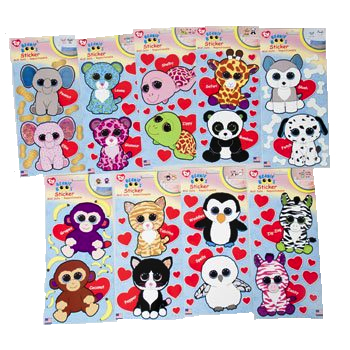 Sneak peek at Valentine’s Day Beanie Boos! Six new Valentine’s Day Beanie Boos have been revealed! The Beanie Boos that will be available are Sugar Pie the pink unicorn (6″ and 13″), Cutie Pie the panda (6″ and 13″) and Cuddly the white bear (6″ and 13″). They should all be available in the next few weeks or so. In fact, the 6″ version of Sugar Pie has been spotted on Cracker Barrel’s online store already! New Beanie Boo T-Shirt available at Justice! Justice are now selling a Beanie Boo t-shirt for girls! The t-shirt has a large design on the front featuring Leona the leopard, Safari the giraffe, Glamour the leopard and Zig-Zag the zebra. The words “Wild at Heart” are printed in large writing. 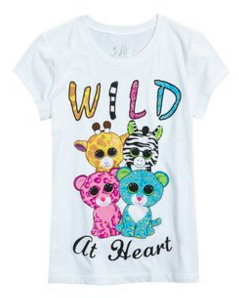 Each of the letters of the word “Wild” are in the colours of the Beanie Boos on the t-shirt. The t-shirt is available in children’s sizes 5-20 and you can find it here on the Justice website. Tonight in the UK is Guy Fawkes Night, or Bonfire Night as it’s more commonly known. When it gets dark, there will be bonfires lit and firework displays off all over the country. Today is also Sparks the bear’s birthday! 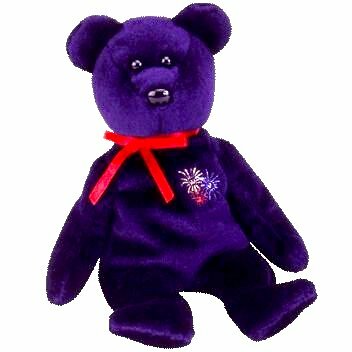 Sparks is a Guy Fawkes Night bear, as shown by his embroidered firework motif. Guy Fawkes Night, historically, originates from the failed Gunpowder Plot to assassinate King James I of England in 1605. Do you have Sparks in your collection? Target are now selling Beanie Boo pajamas! Previously, it was discovered that Von Maur had started selling Beanie Boo nightgowns. Now it appears Target are also selling them as well as a range of pajamas! The Pellie and Waddles nightgowns that Von Maur are selling are also available at Target. 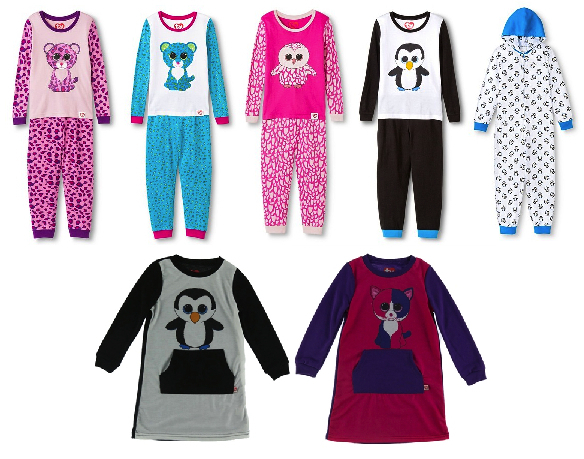 Other designs include Waddles the penguin, Leona the leopard, Pinky the owl and Glamour the leopard pajama sets and a Waddles hooded all-in-one sleeper. They are available in children’s sizes aged 4-16 years old. The pajamas can be found here on Target’s website. Beanie Boo nightgowns available at Von Maur! 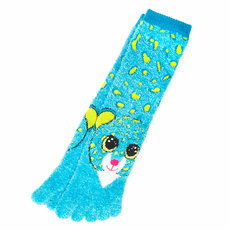 There has been a lot of Beanie Boo clothing and accessories appearing all over the place recently. Esquire Footwear have started selling Beanie Boo slippers and shoes and Claire’s have a whole new Winter accessories range of hooded scarves, hat and mitten sets, earmuffs and toe socks. Now Von Maur are selling Beanie Boo nightgowns! The nightgowns are available in children’s sizes between ages 4-10 years. 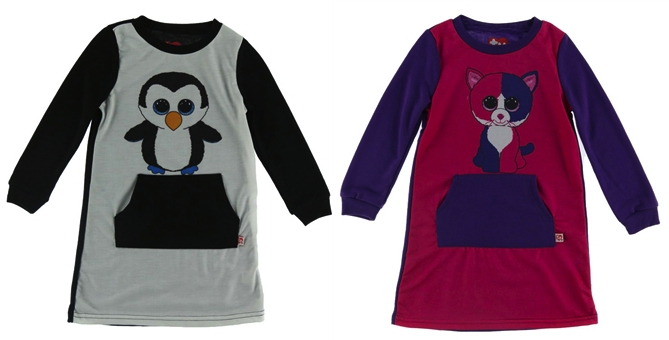 So far, they have two different designs; Pellie the cat and Waddles the penguin. Each nightgown has a kangaroo pocket on the front and they are the same colour scheme as the Beanie Boo they feature on the front. The nightgowns are $26.00 each. 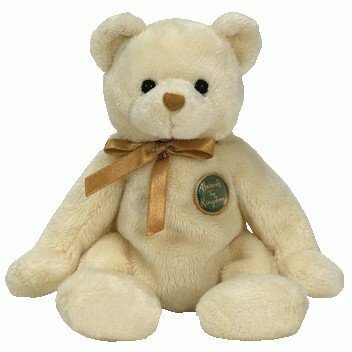 Today is November 4th, and that means it’s Charles the bear’s birthday! Charles was exclusive to the Harrods department store in Kensington, London. As such, he was only available in the UK. Charles was only available for a limited time when he was first released and sold out very quickly.